Alpha continues and since most of us are still waiting for invites, a lot of time has been spent watching the various live-streams broadcast by those who already have access. Despite the limited number of players and a less than complete set of cards, a number of popular strategies, in the form of decks and individual cards, is beginning to emerge. Today we’re going to look at some of these popular strategies! First though, I want to give one final reminder about the Booster Competition that is still running here. You can find full details here, to summarise though, you have 3 ways of entering – you can Like our Facebook page, follow us on Twitter or comment on this article below! Facebook Likes, Twitter follows and commenting on the site here are 3 separate raffles, so if you do all three you have three chances to win – the competition ends on Friday, and the three winners will get 5 booster packs each, once the kickstarter rewards are given out! So, some of the more potent decks that have emerged aren’t exactly surprising, while others may be a little unexpected. In no particular order, here are my observations! Please note that these may not be complete, or 100% accurate – I’m only 1 person, and can’t watch all streams all the time! The first deck I’m going to talk about is a Dwarf/Artifact deck, and while it isn’t hugely surprising that such a deck could be effective given how many cards it has to back it up in Set 1, many people have said that the archetype is missing a number of cards it needs to be viable. Still, I have seen such a deck be very effective indeed. The War Machinist is used to great effect, especially in multiples, due to the large number of artifacts generated by the deck to push through unblockable damage in the early game, which eventually leads up to the fairly obvious use of the Volcannon to end the match. The Worker Bot Factory is a big part of these decks, able to generate surprisingly large numbers of robots to trigger the other abilities – again, more effective in multiples as they are also able to trigger off each other – and, unsurprisingly, the Technical Genius and Research Librarian are also incredibly effective at boosting the speed of the deck. The rest of the deck tends to vary as there are plenty of cards that work pretty well with the core of the strategy, but it almost never relies on directly attacking the opponent with troops to win. It’s tough to say how effective a deck like this will be long term, as cards like Total Meltdown and Extinction, and even Heat Wave, are incredibly effective at shutting it down, especially in the late game when such a loss is very hard to recover from, but for now it seems to be doing pretty well. The next deck is a Mono-Wild deck relies on acceleration effects to get their big creatures down as soon as possible to simply smash the opponent flat – again, unsurprising as this is what Wild does best, but so far it seems to be doing it pretty well. The core of the deck is made up of Howling Brave, Chlorophyllia and the Fist of Briggadon, and uses the first two cards to accelerate into a Fist as early as turn 4. The Fist has proven understandably difficult to deal with in many games, being immune to both damage and Destroy effects (such as those caused by Murder and Extinction) so having that nearly unstoppable mass that early in the game generally brings things to a quick conclusion. Other cards that frequently make appearances in this deck are the Wild Root Dancer, who is able to consistently boost your other troops to dangerous levels throughout the game and, quite surprisingly, the Dandelion Sprite, who despite being a fairly small body is almost as troublesome to deal with as the Fist. The combination of Flight and Spellshield means it can avoid the blockers in most decks, and avoids damage from common sources like Burn. This survivability makes it a great target for the Wild Root Dancer‘s buff, as well as others like Wild Growth, which also sees frequent play. Crazed Squirrel Titan and Pack Raptor are also common in these decks, and I suspect that once the bug which prevents Crash of Beasts from working is fixed, that will become a very popular addition too. 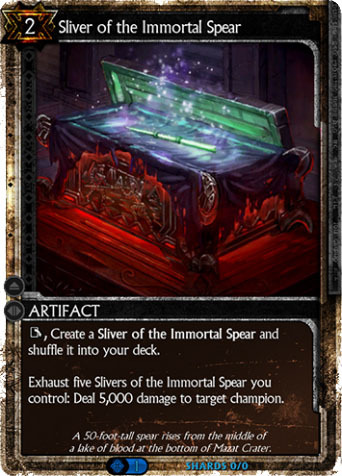 The next deck is quite surprising, in that it frequently uses Sliver of the Immortal Spear as a win condition – a card which was originally written off as a fairly unusable gimmick card. The deck itself has already become quite controversial due to how powerful it is, and how difficult many people find dealing with it. At its core, it is a Diamond/Blood deck with a great many resources (over 30 in some cases), and centres around using the Demented Demolisher to massively thin out your deck once you have the resources you need in play. With your deck then reduced to less than half its original size, drawing the Slivers simply becomes a matter of time. Of course, time is always the problem in games like this, so how does it survive, you ask? This largely comes down to Eternal Youth, whose Escalation effect allows you to rapidly regain a great amount of health, especially after your deck has been thinned. Enemy troops are generally dealt with by a combination of Extinction and Lixil, the Deathless Gem, and Pact of Pain is used to massively increase card draw, with the aforementioned Eternal Youths offsetting the health cost. Surge Mechanism is usually in the deck too, to continually generate resources so that Pact of Pain can be used more often, and sometimes Secret Laboratory, to filter out copies of the Demolisher and Lixil that are drawn later in the game once they are no longer needed. Life Siphon is nearly always included too – in fact some versions of this leave out the Sliver and use Life Siphon as the win condition, but I’ve not seen this very often yet so I can’t say which version is more popular. On paper this may sound like a fairly precarious deck, relying on a lot of things to fall into the right place in order to work at all, but the results speak for themselves. Out of all the games I’ve seen a deck like this used it has won all but one of them, and numerous threads on the official forums exist lamenting the power of this deck. Again, it’s difficult to say how this deck will fare once the missing 70-or-so cards get added, but for now it’s doing horribly well. The last deck I wanted to mention is quite a bit simpler – it’s a general Ruby/Wild aggro deck. As with most aggro decks, it uses cheap, high quality troops to smack the enemy to death, but the most popular version of this currently uses the Gas Troll. 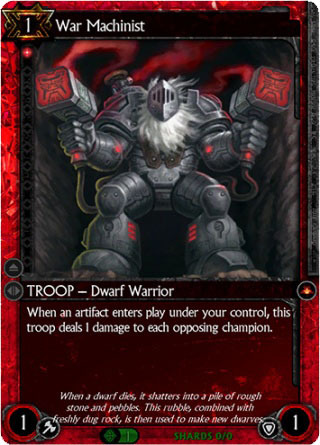 The troll has proven to be an incredibly effective card, frequently reaching 4ATT/4DEF or more on turn 2 and growing far beyond that as the game progresses – multiple copies in play early on almost always results in a win unless quickly countered. The rest of the deck is made up of fairly typical aggro cards like Veteran Gladiator and Burn/Ragefire, so I won’t go into huge amounts of detail on the specifics here (the Hex Community has a great number of articles on the subject if you’re not familiar with it) but I thought it was worth mentioning due to just how effective the Gas Troll has been. Those are the main decks I wanted to discuss today, but obviously this is far from a comprehensive list. Indeed, the subject is so broad that I may follow this article up with another later on continuing the topic! Still, I find it interesting that even with so few players currently in the game and a huge chunk of the cards missing, something of a proto-metagame is still beginning to emerge. As I mentioned earlier, all of my information has come from watching various live-streams of those people who already have access. So, this week’s community spotlight is going simply be a list of links to some of the streams I’ve been watching! Of course, the odds of any one of these channels being live when you click on them is pretty low, so if you wanted to get some up to date news on when people are streaming, you can check out the Fansite Forums, or use the official Hex listing on Twitch. So, here are the links! Not a complete list – I’ve watched a lot of streams and it’s hard to keep up with who’s who sometimes, so if you have a Hex stream please feel free to drop a link in the comments below! Also feel free to comment if you’ve seen another popular deck type that’s going well and want to talk about it – remember, comments equals contest entries! That’s all for today! Check back next time when I reveal where all those socks that get lost in driers go! This entry was posted in Alpha, Cards and tagged alpha, decks, proto-meta by Icepick. Bookmark the permalink. Nice write up! Mono wild and wild/ruby both look like fun decks. Actually they all look like fun. I watched some streams of KroanNL using a Blood/Sapphire control deck that looked interesting too. So how does one stop the Fist of Briggadon without polymorph dingler and pacifism ? You don’t, basically! If you have an 8/8 or larger you can block him consistently, and bounce effects like Yesterday or the Bucaneer (when it becomes available) work, but besides that, effects like Inner Conflict and Dingler are all you can do. Chaos Key. Run at least 2 in any deck if you don’t have other counters. my opinion. I’ve seen those deck, and I didn’t saw the dwarf deck as powerfull as the others. The diamond/blood Sliver deck seems to have some good combos, I’m not sure if some of them were intended.